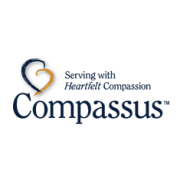 The mission of Hospice Compassus is to honor life and offer hope to individuals facing a life limiting illness by supporting them with compassion, integrity, and excellence. Our vision at Compassus is that patient care and service are our highest priorities and primary reason for existence. We will be the highest quality hospice provider in every community in which we operate. We will provide an attractive environment for hospice colleagues and volunteers-recognizing and acknowledging that our people are our greatest asset in providing quality care and service to our patients, their families and community. Our Volunteers are lay for professional individuals who offer and provide their services to hospice without compensation.